Thank you O2! This is the sort of customer service I love. Bubbles! Posh bubbles. I’ve been with O2 for so long I don’t remember when I joined. And little touches like this make want to stay. Was habe ich mich heute gefreut als ich gesehen habe, dass der Nikolaus über Nacht da war. Weg konnte er ja dank leuchtenden Stiefel gut finden. Und hat wunderbare Sachen da gelassen: Schokolade, Creme und Trüffelsplitter. Trüffel! Viel besser als Mamdarinen. Die mag ich sowieso nicht. 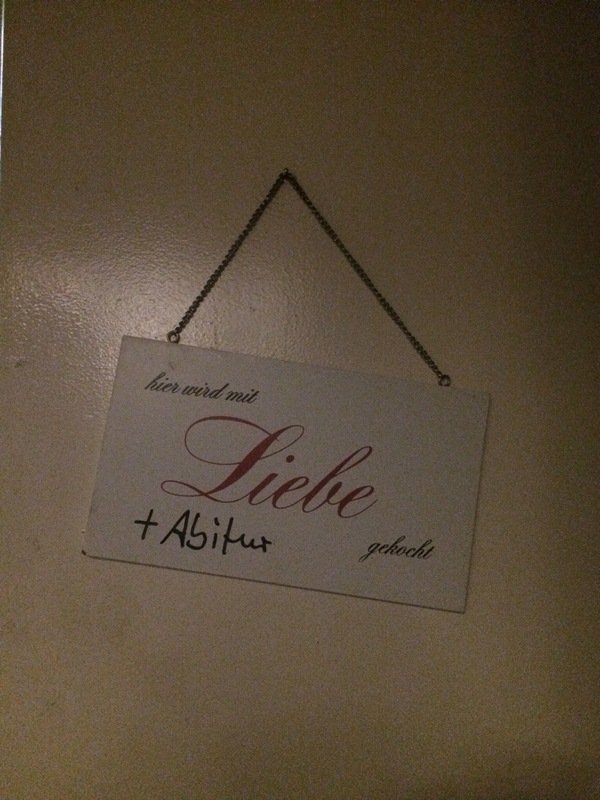 Danke Mami! Eh Nikolaus meine ich. Mamilaus. Nikomami. Ich bin vor Freude ganz überschwänglich. I have been freezing all day so was in desperate need of something warm to eat. Some soul food. Got adventures with trying | inventing a new risotto. With pears and lots of blue cheese. Omnomnomnom. And I love cooking risotto. It relaxes me big time. Papi and I went for dinner at the lovely Landwirt. Papi claims it was the best liver he has ever eaten. I wouldn’t know. I was busy enjoying my Königsberger Klopse. The sign at the kitchen made me laugh. Good is not only prepared with love. The cook also has his A-levels.